During the 9 months of pregnancy, a woman’s body goes through extraordinary changes. If this is your first pregnancy, you might be astonished by the number of small surprises that you discover during your term as a result of pregnancy’s effect on the skin. One of these may be a thin, darkish line that runs from the naval (belly button) to the pubic area. This line can also extend from the pubic area through the naval to the top of the belly. No need to worry, though! This is linea nigra, a common – and harmless – skin condition of pregnancy. The medical term linea nigra is Latin for black line. In reality, however, linea nigra isn’t black but rather darker in color than the surrounding skin, so ultimately its color varies depending on skin tone. Linea nigra can extend from the top of the belly down the vertical midline through the belly button to the pubic area. It’s usually about 1 cm wide. What’s interesting about linea nigra is that the line has always been there, but you probably didn’t notice it! Before pregnancy it is the same color as the surrounding skin. During pregnancy the line may darken as a result of hormonal changes. When you are pregnant, your body boosts its production of estrogen, which in turn increases the production of melanin. The result is skin that is more prone to hyperpigmentation, which is darkening due to increased melanin. 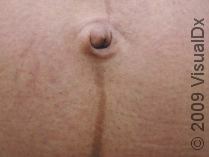 Linea nigra usually appears during the second trimester. It can happen in an individual of any race or ethnicity but tends to be more apparent in women with darker skin tones. It is a perfectly harmless skin condition and usually fades on its own within a year after giving birth. Sunlight will darken linea nigra, causing it to take longer to fade. This is true for tanning booths as well. There is no specific treatment for linea nigra. To encourage fading after pregnancy, use sunblock or keep your belly covered. Do NOT use any fade or bleaching creams while you are pregnant. There are old wives’ tales that claim the appearance or length of linea nigra predicts whether you will have a boy or a girl. These predictions are light-hearted and fun for games, but there is no medical basis for these claims. For more images of linea nigra go to skinsight.com.